Navigator Pro 7x30 is rated 5.0 out of 5 by 4. Rated 5 out of 5 by Molehill from Impossible to fault! I bought one of these 7x30 Navigators to spot feeding frenzies when sea fishing on my boat. They added a new dimension to finding fishing marks because the definition they give is so good that birds in the air are particularly easy to spot from a long long way off. So I bought another pair for the farm and I reckon they save me time every single day, because the clarity they give saves me having to 'go see' what is going on. They are so light compared to the 7x50 model that I often keep a pair round my neck. It may be that as I have grown older my sight is not quite what it used to be but these 'glasses' are truly in a class of their own. Rated 5 out of 5 by Ryan77 from Reliable, good all around optics I bought these binos for law enforcement work. These are my second pair of Steiners. I am a patrol officer in Ohio. The rubberized coating in nice to have since I carry a lot of gear. The coating keeps things quiet and protected. The lense covers do a nice job of keeping things clean when they are stuffed in my gear bag. I'm a huge fan of the sport-auto focus. Once you have them set, you can pick them up and see anything from 20ft to infinity. Really useful in with my job when I have to grab them to quickly read a license plate or identify a suspect. I don't have time to mess with focusing them. The clarity is always great. The eye relief cups fit me well and I can grab these binos one handed and see whatever I need. I recently took them to Yellowstone on vacation. They were perfect for wildlife viewing and carrying them in the car. Again the rubberized coating kept them quiet and protected. The coating also keeps the binos in place in a vehicle. We could put them on the vehicle dashboard and they stayed put while driving around. Again, the auto focus allowed us to quickly pick them up and view grizzly bears, bison, elk, etc. without messing with them. They are great all around binoculars. Would you recommend the navigators for star gazing? 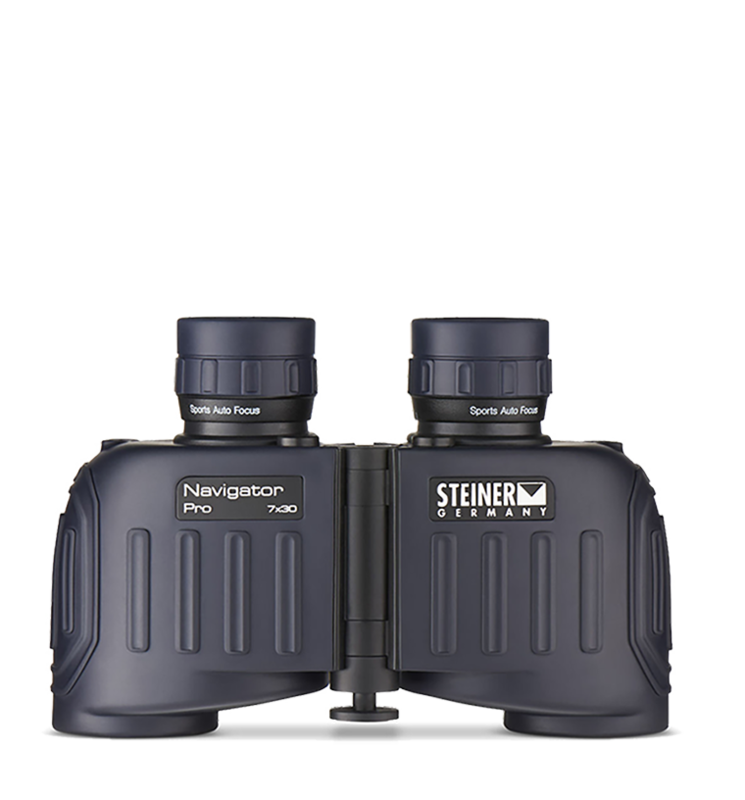 The blue tint of the Navigators may block wavelengths that you want to be able to see, I'd recommend the Military marine binoculars as an alternative. Can I get my Binocular Re-coated? what is the difference between the marine and navigator series? The main difference between the Marine and Navigator lines is that the Navigators offer a slightly wider field of view, and they can be submerged to a depth of 6 ft, while the Marines are only waterproof, not submersible. What is the difference between the navigator pro 7x30 and the navigator pro 7x50? The major difference is size: the 50mm are much larger and heavier, but gain a larger exit pupil and light gathering ability. Are the optics in the Navigator 7x30 and the MM 8x30 the same? If they are different how do those differences affect performances in bright and low light conditions? Do they transmit color the same? The glass is similar, but the coatings are different. the Navigator's have blue-tinted lenses to cut glare off the surface of the ocean. They will perform similarly in low-light.